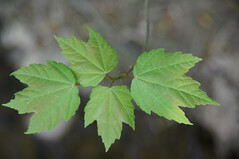 Different plants are suited to different habitats. Just as you wouldn’t expect to find a deer living in a tree, you wouldn’t expect to find skunk-cabbage growing at the top of a dry ridge. Knowing more about the habitat needs of different plants can help you know where to find them in Rock Creek Park. Why Don't All Plants Grow Everywhere? Why Don’t All Plants Grow Everywhere in the Park? 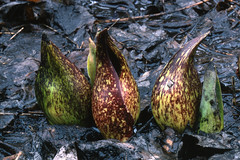 Skunk-cabbage (Symplocarpus foetidus) is found in areas where groundwater saturates the soil all or part of the year. Photographer: Alfred SchotzJust because a certain plant lives in Rock Creek Park doesn’t mean you can find it anywhere you look. Every plant species requires or tolerates specific environmental conditions, and all have a limited range of environments in which they thrive. Some plants do best in shade, others in sun. Some need fertile soil, others make do with infertile soil . Some can withstand floods, some can withstand droughts. Some can survive wildfires, some can’t, and some actually depend on fires. For more information on how different plants thrive in different conditions, see The Secret Lives of Plants in Ecology Basics. In Rock Creek Park, skunk-cabbage may be the pickiest plant. It’s a specialist, meaning it requires a very specific set of conditions. 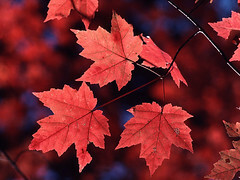 Red maple (Acer rubrum) is a "generalist"—able to grow in many environments. 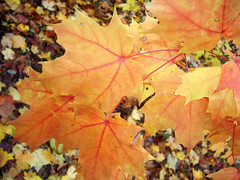 Red maple is probably the park’s least picky plant—you can find it in any of the park’s natural communities . It’s a generalist, meaning it can grow in diverse habitats. 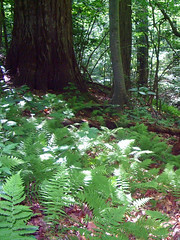 New York fern (Thelypteris noveboracensis) thrives in the muted light below sun-loving trees. Photographer: Ery Largay, courtesy of NatureServeKnowing what conditions a plant can and cannot tolerate helps you predict where you will find it in nature. On the other hand, plants that require complementary conditions grow together as well. For example, sun-loving trees that grow in the forest canopy create ideal conditions for shade-loving plants in the understory . Look at the lists of habitat preferences below and think about which species might grow well together. 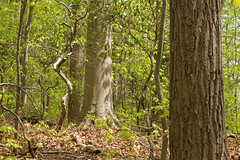 American beech, chestnut oak, and mountain laurel grow together on steep hillsides in the Oak - Beech / Heath Forest. Can you figure out why? Photographer: Sam Sheline, courtesy of NatureServeAfter learning about habitat preferences of some of the plants (below), explore the Plants and Animals pages of Rock Creek Park's natural communities to see examples of natural groupings of plants. Can you see why they're a natural fit? 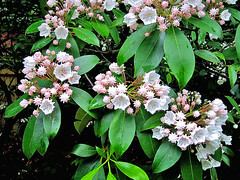 Note: Habitat preferences for non-native plants common at Rock Creek Park are discussed in Non-Native Invasive Plants. Christmas fern grows on shady forest floors. 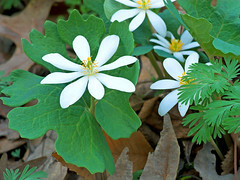 Spring ephemerals like bloodroot and Dutchman's breeches need early spring sunlight, before trees leaf out. Fresh new spring leaves of red maple grow in the understory. Mountain laurel resprouts from underground rhizomes after fire. Sugar maple doesn't survive fire. Tuliptree grows well on cleared land. 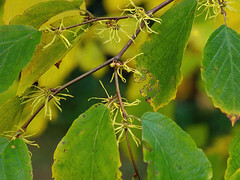 Witch hazel can be found on steep slopes. 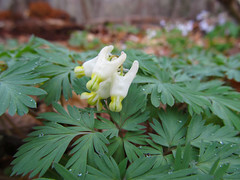 Dutchman's breeches grow best in nutrient-rich soil. 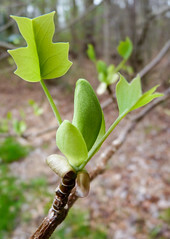 Spicebush is at home on floodplains. 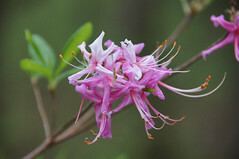 Pink azalea can grow well in droughty soil. 1. Sullivan J. 1994. Carpinus caroliniana. In: Fire Effects Information System, [Online].